It’s always important to look at your bottom line, where you can make a strong margin without compromising on quality. At AKW we have made absolutely no compromise of quality in our wet room products, but at the same time we have been able to offer truly competitive pricing, speedy delivery, excellent lifetime guarantees and last but not least, unrivalled support from us on all our wet rooms and wet room products. Here at AKW we like to design and test our products, within our UK lab facilities, to ensure your client will be happy with the supreme quality and you won’t be getting any calls back because of leaks. We are so confident in our quality that we offer leakproof guarantees, so you know you’re always covered! Our no-hassle easy-fit products are backed by an amazing UK based technical support team, many of which are experienced installation contractors and ex-plumbers, who will ensure you only have to do that particular job once, to perfection. Our range of wet rooms and wet room products is extensive, because we understand that requirements can vary dramatically between clients and individuals. This also helps you as the installer, making your life easier to create the perfect wet room for your client, no matter their budget or bathroom size. 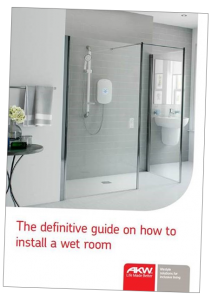 If you’re not sure on any part of the wet room installation process or just want to show your clients how things work, then why not view our video tutorials? They are full of different tips and useful information to help you through the process of installing. Contact your local dealer for our competitive rates! There are hundreds of branches around the country with AKW Wet Room products in stock and ready to be collected. We’re pretty much positive that there’s one in a location that is convenient for you. Click below to find your nearest dealer.